The Department of Public Safety has been notified of recent parking complaints made to the City of Minneapolis. As a result, certain area 1-hour parking spaces (specifically the 2000 block of 6th Street) will be seeing targeted enforcement. Vehicles parked in 1-hour zones for longer than 1 hour without a critical parking sticker are highly likely to be ticketed in the upcoming weeks. Posted on December 10, 2018 Email a correction for this post: Looking for an internship at a nonprofit? The application is available at the URGO website (www.augsburg.edu/urgo) at the “on-campus research” page. Grants are awarded on a rolling basis, so student-faculty research teams are encouraged to submit proposals in the fall. The URGO Advisory Committee meets bi-monthly and began reviewing proposals September 10th. Starting August 25, 2019, a lucky group of students will spend their semester traveling the length of the Mississippi River–from source to sea, with stops in St. Louis, Memphis, New Orleans, and countless small communities along the way. Complete your application before Dec. 15th and receive a $500 early registration discount, and apply for one of the Pentair Scholarships, worth up to $3,000 toward the cost of the program. Students enroll in a full set of college courses and full financial aid applies. To get a feel for some of what this experience is like, check out the short videos made by Kristy Ornelas, one of the students on the 2018 River Semester. Take Documentary History and Theory and make Wednesday’s this Spring a movie night! This course studies the history of film’s nonfiction art form, as well as the theoretical methods of engaging the world through a lens. Through the study of selected documentaries, students will identify and analyze the filmmaker’s point of view and the methods used to deliver the message. The course is offered in Communication Studies, Film, and New Media. It fulfills a Humanities LAF. It’s late and it’s breakfast! Monday, Dec. 17, 9:30 pm to 10:45 pm, Christensen Center, Commons. Free to students with Augsburg ID. Provided by A’viand’s food service. 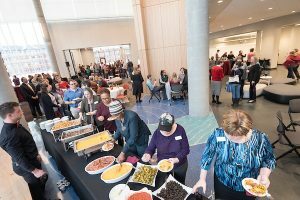 Chief Diversity Officer Joanne Reeck will provide an overview of how Augsburg’s Diversity and Inclusion Certificate Program has grown and will share feedback from participants about how the program has helped them in their ongoing work at Augsburg. Chief Student Success Officer Katie Bishop will provide an update regarding Augsburg’s equity work in support of student success. Ann Garvey, vice president for Student Affairs, and Kathy McGillivray, Director of the CLASS Office, will provide an overview of the work of the Accessibility Subcommittee—which is part of the University Council structure as a subcommittee of the Diversity, Inclusion, and Equity University Committee. An info session will take place Wednesday, December 12th at 6:00pm in OGC 100 for all interested students. Kristian Evans, one of last year’s Peace Scholars from Augsburg, will answer questions about the program for students interested in applying. Join Campus Ministry, Augsburg Latin American Students and Latinx Student Services, and Augsburg University Student Ministry in celebrating the Virgin of Guadalupe on Wednesday, December 12, in chapel at 10:40am. “Our Lady of Guadalupe has become an eminent image throughout Latin American and even North America and is often seen as an advocate for migrants and vulnerable populations across the Americas.” Bring any images of the Virgin you may have to join the display. Tamales served after. Please join campus ministry and professors from Spanish department in rehearsing “La Guadalupana,” song for Virgin of Guadalupe celebration Dec 12. 11:00am in chapel at 10:45 on Dec 11, and 9:00am Dec 12. Violin, guitar, tambourine, hand-drums, all most welcome. Programs in Hawaii, Puerto Rico, Slovenia, The Netherlands, China, Mexico, and More! We will have information about the many program options, as well as advisors and program leaders on hand to answer your questions! Join us in Hoversten Chapel at at 10:40 am for 20 minutes of relaxing yet invigorating breathing and stretching exercises led by Krista Costin ’08, a yoga meditation instructor. Celebrate the Holidays and the conclusion of another successful semester at our annual faculty and staff holiday party. Thursday, December 20, 3 p.m.-5 p.m. | Hagfors Center Commons and Classroom 150. 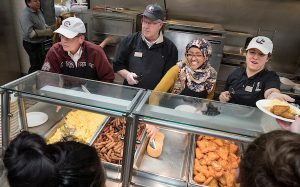 Faculty and staff are encouraged to bring contributions to Augsburg’s Campus Cupboard. Staff from Campus Activities and Orientation are presenting at the 2018 National Association of Student Personnel Administrators (NASPA) Leadership Educators Institute. Joanne Reeck, Michael Grewe, and Nancy Huynh, are presenting on Augsburg’s Emerging Leaders Program (ELP). Augsburg’s ELP was also submitted for the 2018-2019 NASPA Excellence Awards; notifications will be in January. AUGSBURG STUDENT CARDEN OLSON AWARDED U.S. DEPARTMENT OF STATE’S GILMAN INTERNATIONAL SCHOLARSHIP TO STUDY ABROAD! The U.S. Department of State is pleased to announce that Carden Olson from Augsburg University was selected to receive the prestigious Benjamin A. Gilman International Scholarship to study abroad this Summer 2019. Carden is a Psychology major with a minor in Sexuality Studies. He will be studying this summer in Copenhagen, Denmark through DIS (Danish Institute for Study Abroad). Since 2008, fifty six Augsburg students have received Gilman scholarships, totaling $220,500.